How Fast Do Reticulated Pythons Grow? Reticulated pythons (Python reticulatus) live in tropical rain forests in Southeast Asia, and can usually be found near water. These snakes have a complex geometric, netlike pattern over their skin, which is where they get the "reticulated" part of their name from. Strict carnivores, members of this species tend to ambush their dinner and can manage to swallow prey as large as deer. 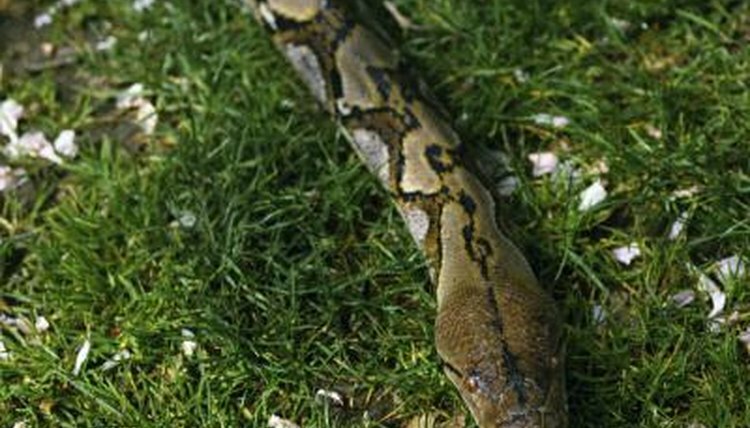 As the longest snake in the world, reticulated pythons have been known to grow more than 30 feet in length, although it's more common for them to measure around 20 feet. For the first two to three years of their lives, they can grow more than five feet in a year, after which their rate of growth slows down a little. If well fed, they can be more than 8 feet at a year old and more than 12 feet by the time they reach 2 years of age.